Taste test: These are fairly thin, extremely flavorful jalapeño chips with a medium level of heat. They've got as much jalapeño flavor as any chip I've tried  with quite a bit less heat than some, but still a reasonable amount for those who are in it for the heat. 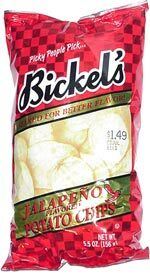 The claims that Bickel's makes about searing the flavor into the chip ring true when you taste them  they've just got a ton of flavor. These were very popular around the chip bowl. Smell test: Very mild jalapeño smell, not hot.